Does anyone else have a “snacking on cookie dough” guilty pleasure? 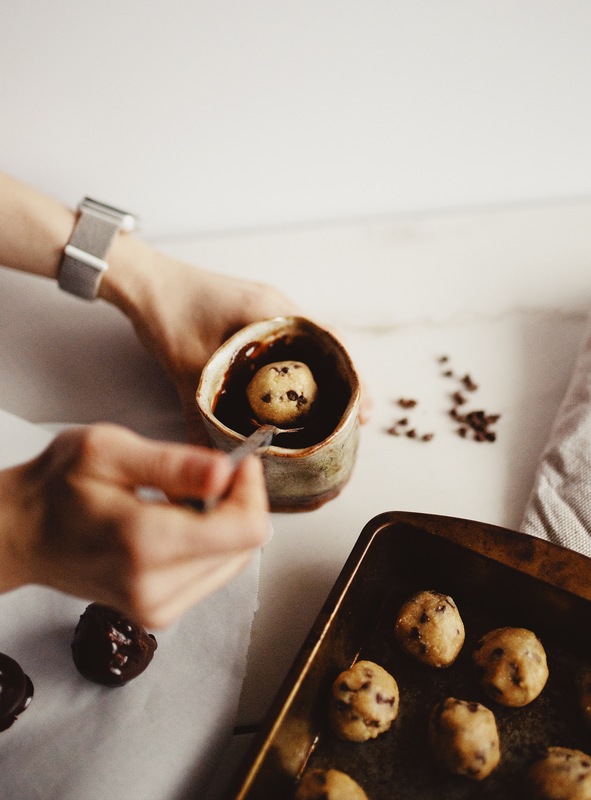 Now imagine: a ball of delicious cookie dough with mini chocolate chips, coated in thick chocolate. This is real life. 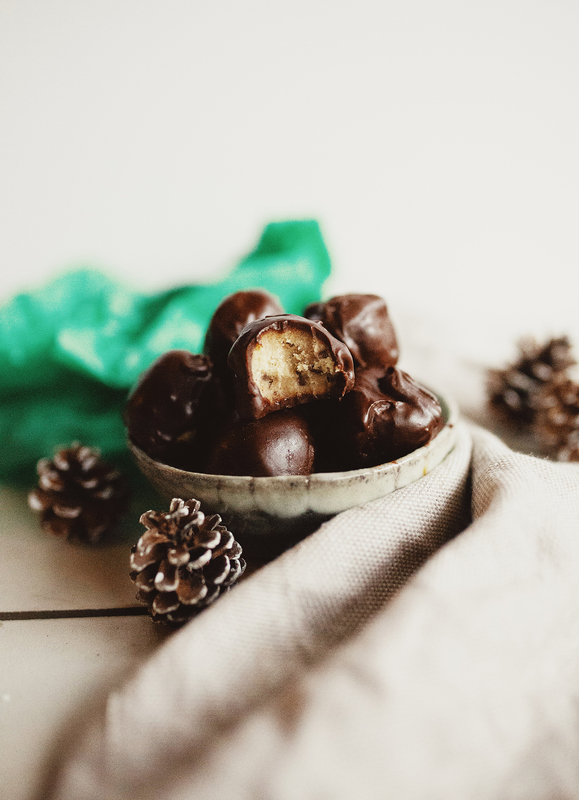 This year I decided to give a healthy(ish) cookie dough ball recipe a try. 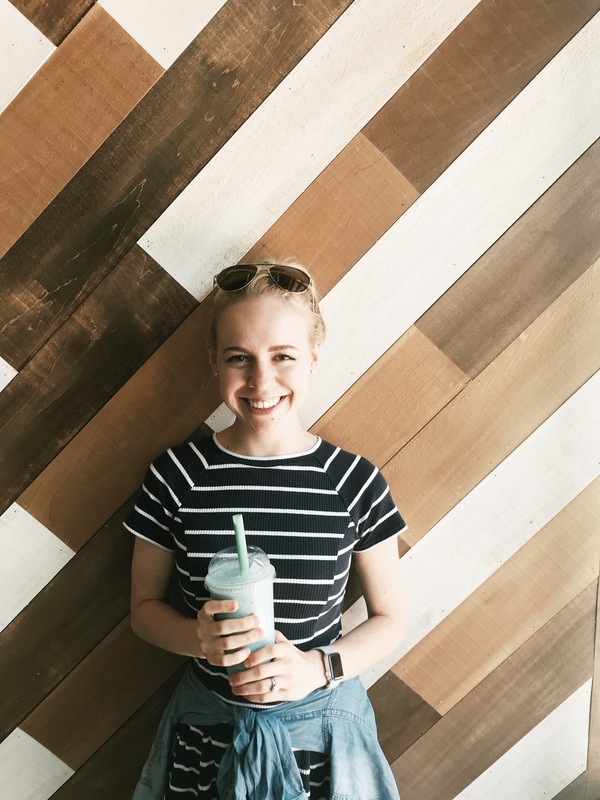 I made it grain free, gluten free, and vegan—and it turned out amazing. If you’re looking for a new recipe to bring to your next cookie exchange or holiday party—you’ve come to the right place. 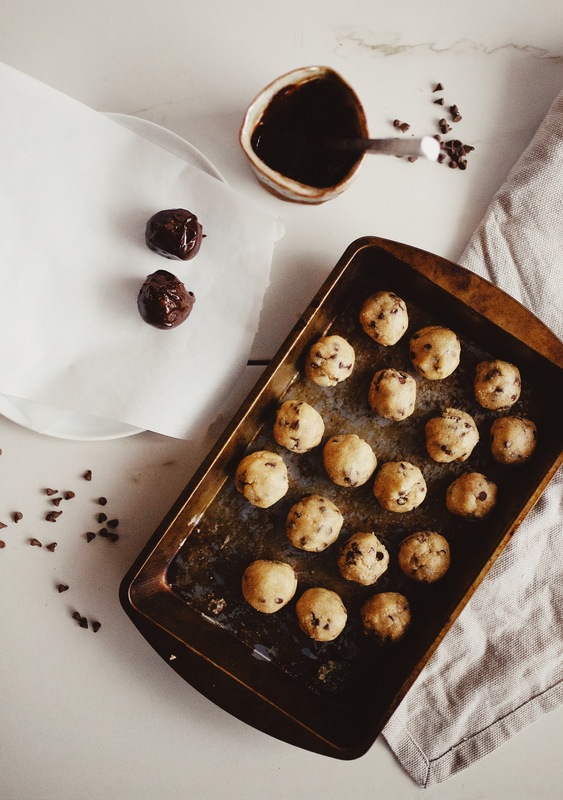 Because honestly, no one can turn down a ball of cookie dough. 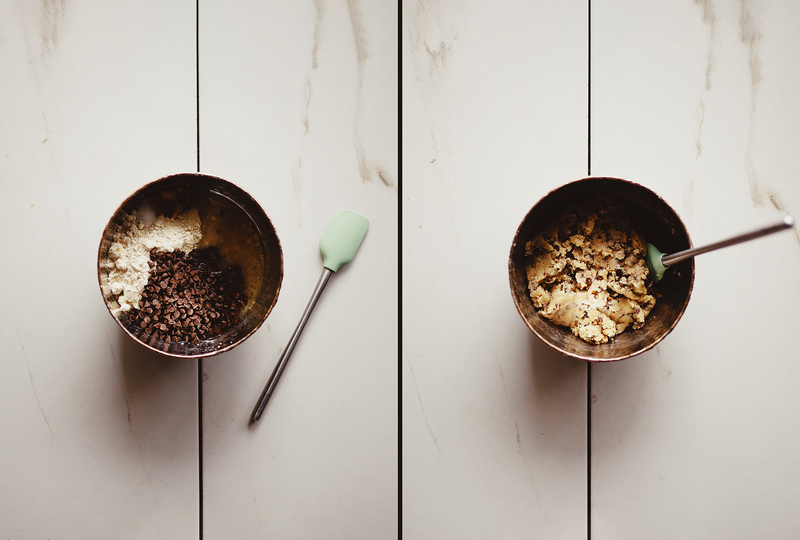 Let’s make some Gluten Free Cookie Dough Truffles! This chocolate chip cookie dough is incredibly easy to make. Since it is 100% egg-free, there is no baking required and the dough is ready to indulge in as soon as the 6 ingredients are mixed together! The chocolate coating may take a little more patience, but I promise, however pretty (or not so pretty) your truffles turn out, they will taste incredible regardless! 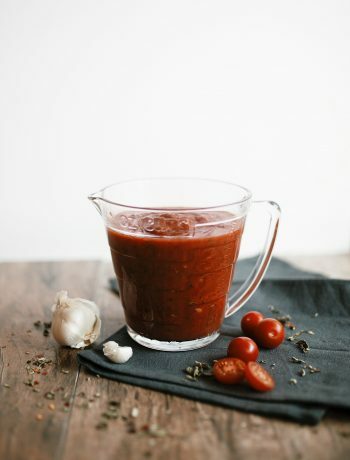 To make this recipe gluten free and grain free, I used almond flour! Do yourself a favor and grab a bag. 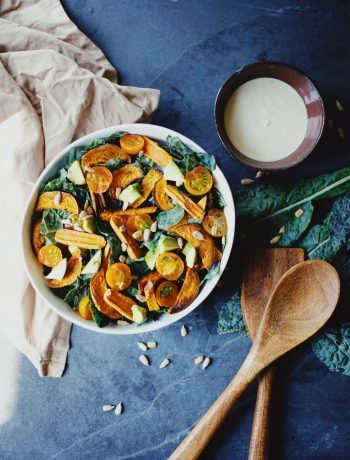 While almond flour can sometimes be tricky to cook with, it does wonders in this recipe. Here, almond flour, along with coconut oil, raw honey (or maple syrup), and lots of vanilla truly imitate the taste + texture of a classic cookie dough batter. Your friends will never guess that those tasty cookie dough truffles are really gluten free, dairy free + mostly, naturally sweetened! If you like this sweet, treat you might also enjoy my tahini ginger cookies, gluten free apple muffins with cinnamon crumble, pumpkin mug cake, or my black bean brownies with cashew butter frosting. 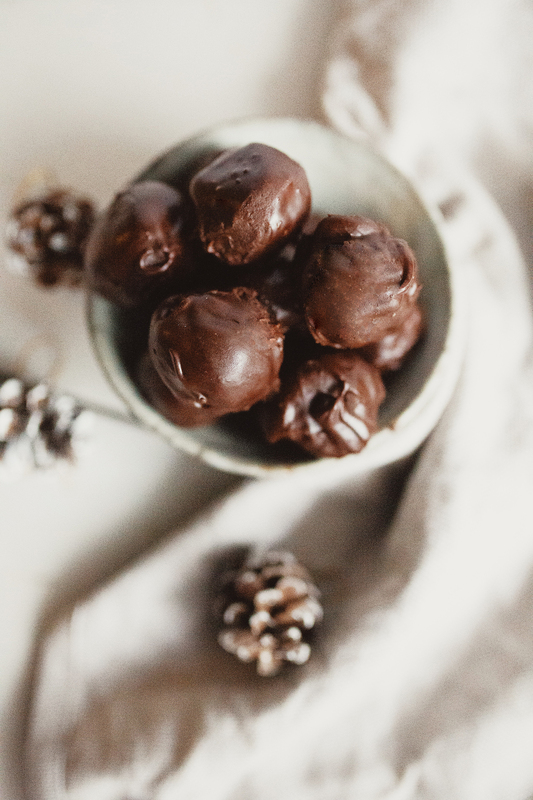 If you’re looking for a new treat to bring to your next cookie exchange or holiday party, try my Gluten Free Cookie Dough Truffles, because, who can honestly turn down a ball of cookie dough? 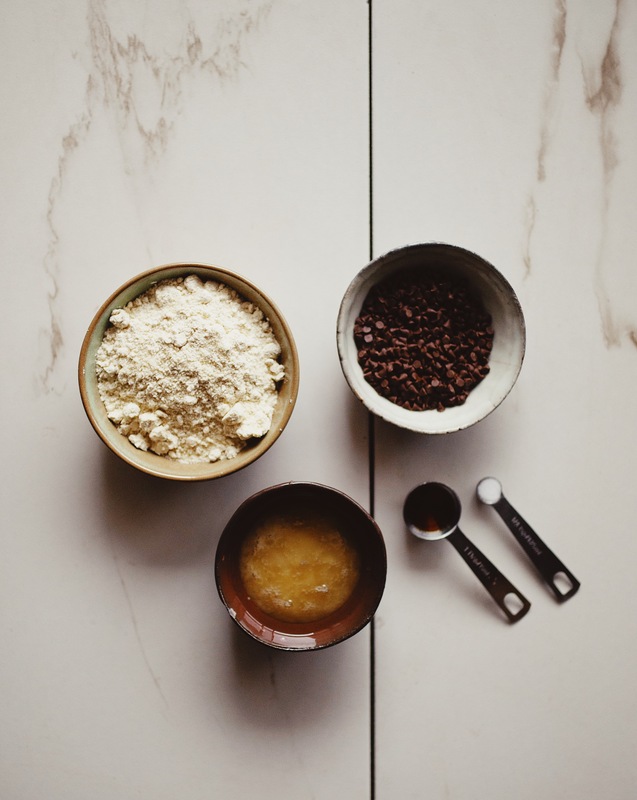 In a large mixing bowl, combine almond flour, melted coconut oil, honey, vanilla, salt and chocolate chips. Stir until well combined. Using a Tbsp. measuring spoon, scoop out dough and roll into a tight ball. Set ball on small baking sheet and repeat with remaining dough. Place sheet in freezer for 1 hour, or until truffles are very firm. A couple minutes before removing the truffles from the freezer, pour chocolate chips and milk for the coating into a large, deep, mug. Line another baking sheet or large plate with parchment paper. Using a spoon, dunk each truffle into the chocolate. Gently turn to coat, remove from mug, and set gently on baking lined sheet or plate. Repeat with remains truffles. Microwave more chocolate if needed. 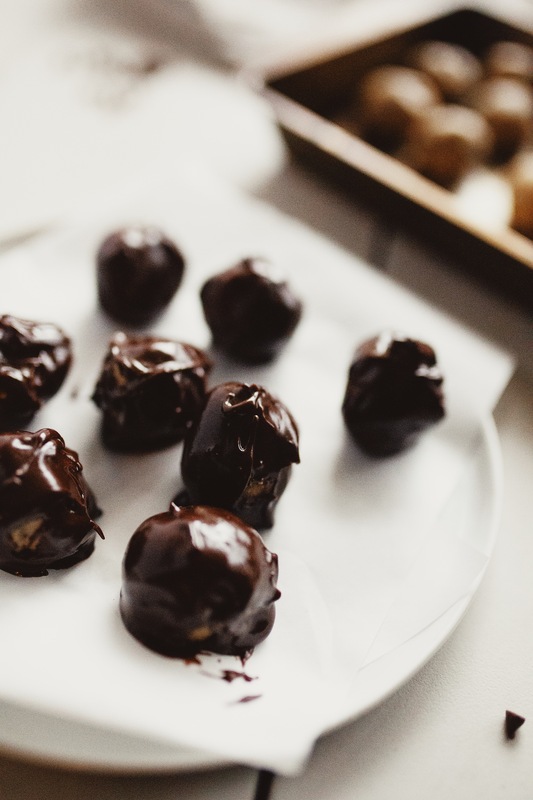 Freeze completed truffles for up to 2 hours, or until chocolate is stiff. Enjoy immediately. Leftovers can be stored in airtight container at room temperature, though are better refrigerated or kept in freezer. *alternatively, this step can be completed with a double boiler over the stove. Nutrition information is a rough estimate of 1/20 of the entire recipe.